As we wrap up and reflect on our season of shorebird science in the arctic, we want to thank all of the extraordinary people who helped make this another successful field season. 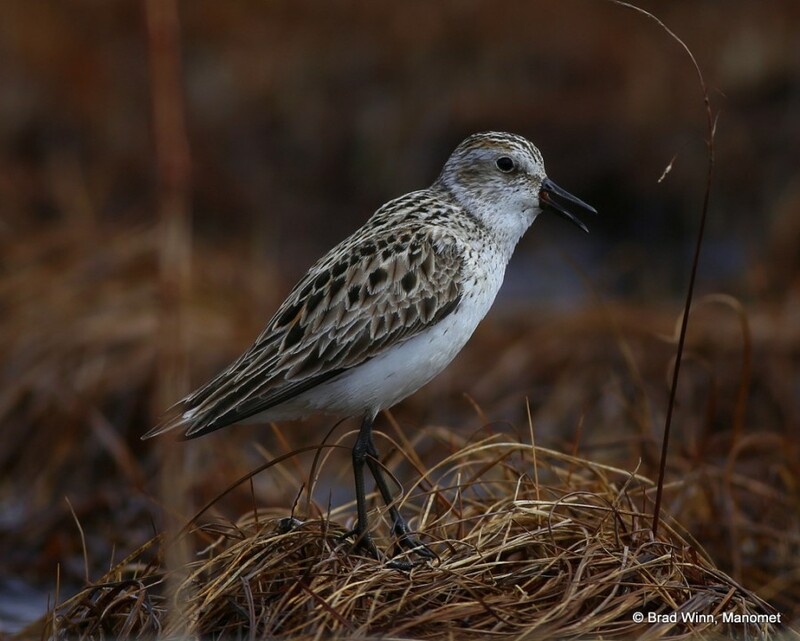 We had two major expeditions this year, so we have two sets of people to thank, including the Yukon Delta National Wildlife Refuge survey team and the Coats Island Semipalmated Sandpiper geolocator project team. We especially want to thank Liza LePage, who manages the blog posting and brought you all of our stories all season! 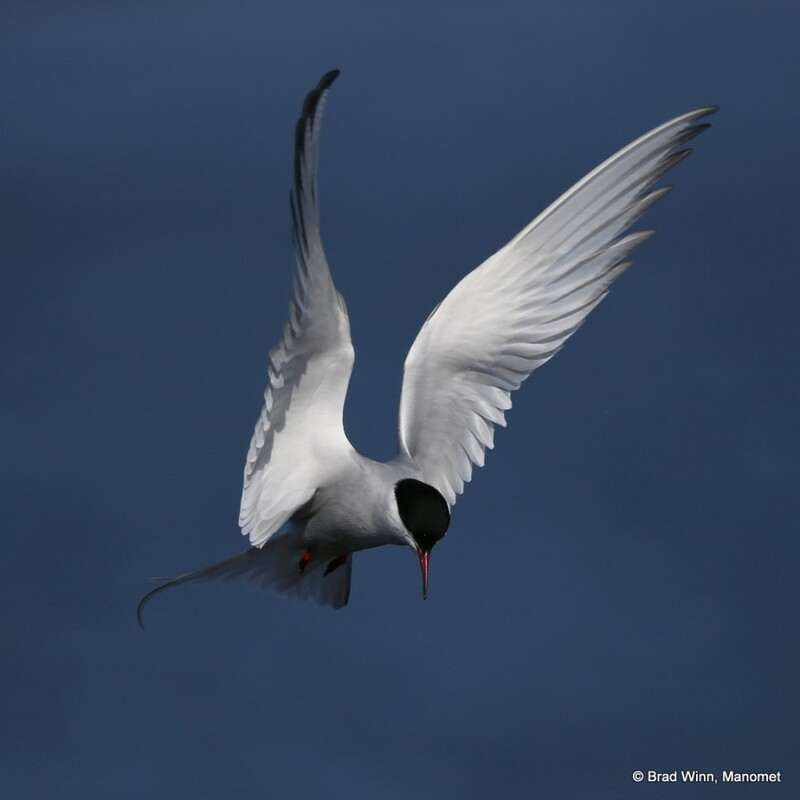 An Arctic Tern hovering in the Yukon Delta National Wildlife Refuge. Photo by Brad Winn. 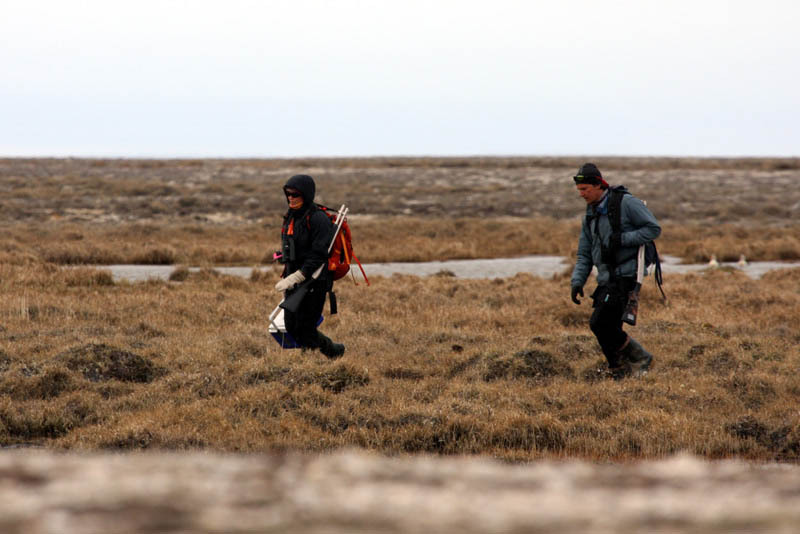 It took a large team of partners to plan and implement one of the largest surveys of its kind in the Yukon Delta National Wildlife Refuge. We are very grateful to the excellent staff at the Refuge, including Brian McCaffery and Kristine Sowl, who advised us all along the way and worked with us both in the office and in the field. The design team, including Jim Lyons, Brad Andres, and Jim Johnson, sorted out the complex habitats of the Refuge and planned the survey plots to be visited. 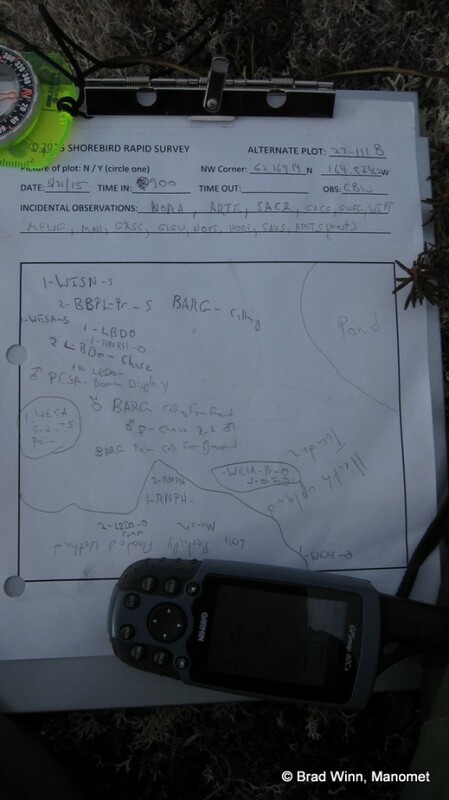 One of the field data sheets from the Yukon Delta. The sheets show all of the birds seen in a 400 by 400 meter plot. Photo by Brad Winn. Sarah Saalfeld and Jim Johnson put in countless hours sorting out preparations and logistics, especially the plot maps that guided all our work. Metta McGarvey worked on everything from budgeting to field logistics to every manner of field support. We couldn’t have done this without her. Our two survey teams worked tirelessly in the field, including Rick Lanctot, Susan Savage, Jim Lyons, and Diane Granfors in the south working out of Bethel, and Brad Winn, Bob Gill, Metta McGarvey, and me working in the north out of St. Mary’s. A male Western Sandpiper calling. Photo by Brad Winn. Our excellent helicopter pilots from Pollux Aviation (Shannon Glenn) and Hermens Helicopters (Stan Hermens) took us safely across the huge survey area in all weather conditions, and were critical team members. Isaac Bedingfield of God’s Country Aviation delivered fuel to remote locations enabling the Bethel helicopter crew to access far-flung survey sites. River Gates worked with us both on logistics for the trip beforehand, and on data entry when we returned. 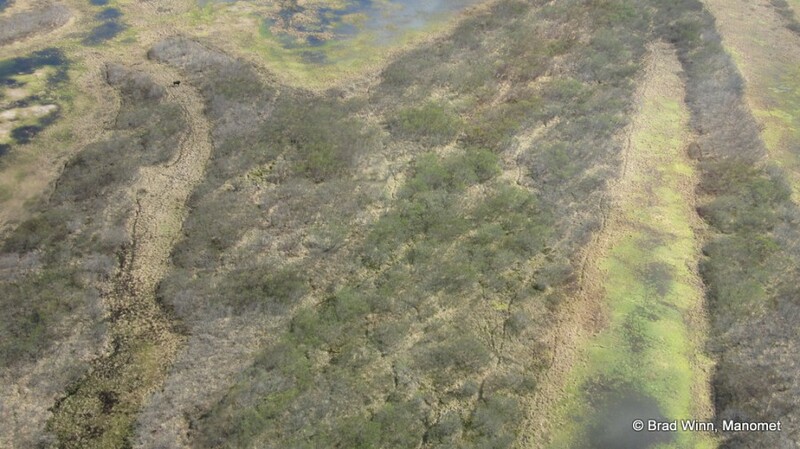 An aerial view of the Yukon River edge. See that small brown dot in the upper left? That’s a moose. Photo by Brad Winn. The coastal survey boat crew, including Mark Agimuk, Kristine Sowl, Jessica Stocking, Brian Robinson, and Alan Kneidel, worked extremely hard to access some of the most remote plots that had to be visited by boat and fixed-wing aircraft, and made it possible to survey the entire Refuge by adding these inaccessible areas. 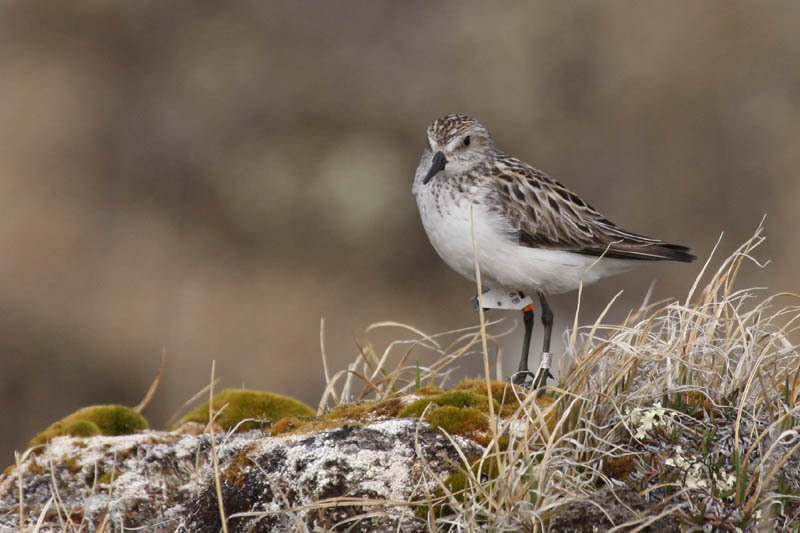 Our Coats Island Semipalmated Sandpiper geolocator project was led by Shiloh Schulte. Despite dismal weather, Shiloh and his team were able to tag 29 Semipalmated Sandpipers. This wouldn’t have been possible without the support of the following people. 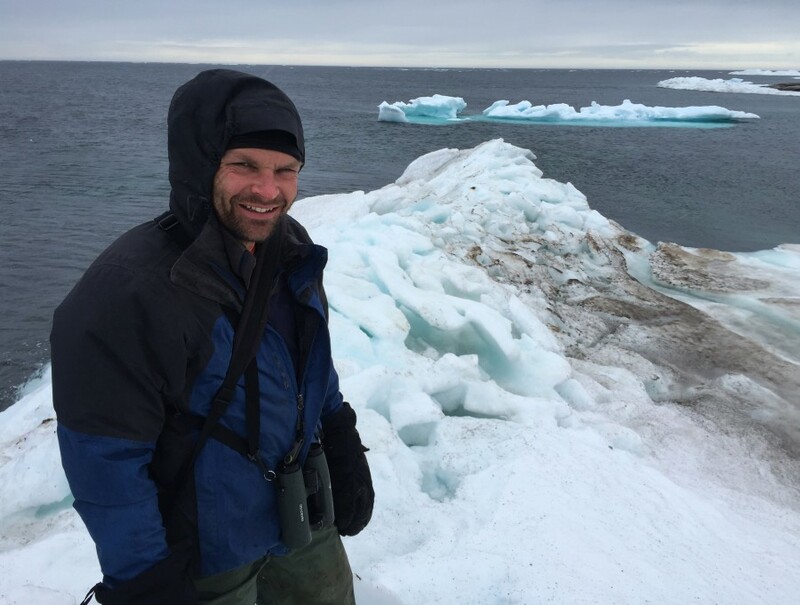 Shiloh Schulte stands at the edge of the sea ice on Coats Island, Nunavut, Canada. In recent years the sea ice is thinner and has moved out earlier than ever before. Paul Smith of Environment Canada provided invaluable guidance during the project. 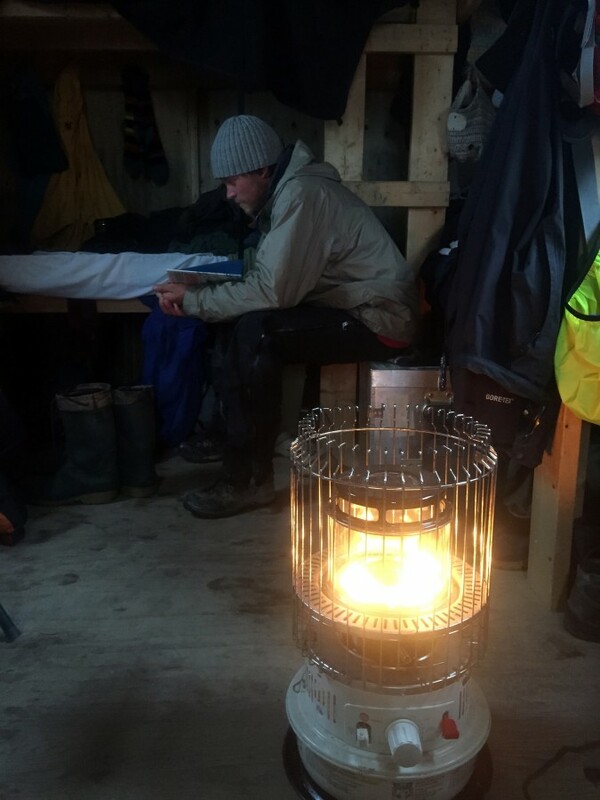 Working with Paul in the field is an outstanding experience – he is extraordinarily capable, always optimistic, and willing to share useful information and advice on any topic, from camp food prep to the practical implications of large scale changes in Arctic weather patterns (more bears in camp!). 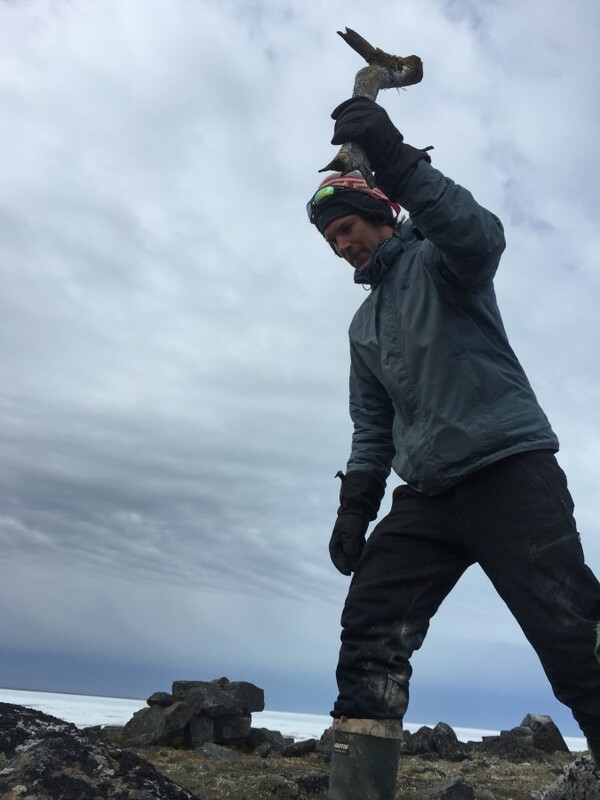 He made it possible for Shiloh to get into camp easily and focus on the work at hand, instead of the massive amount of logistics and preparation that goes into any Arctic field season. An Arctic Fox kit explores the world just outside its den. Arctic Foxes are the main predator of shorebird nests. They survive the harsh arctic winters by finding and caching eggs and other food during the brief but productive summer months. Photo by Shiloh Schulte. 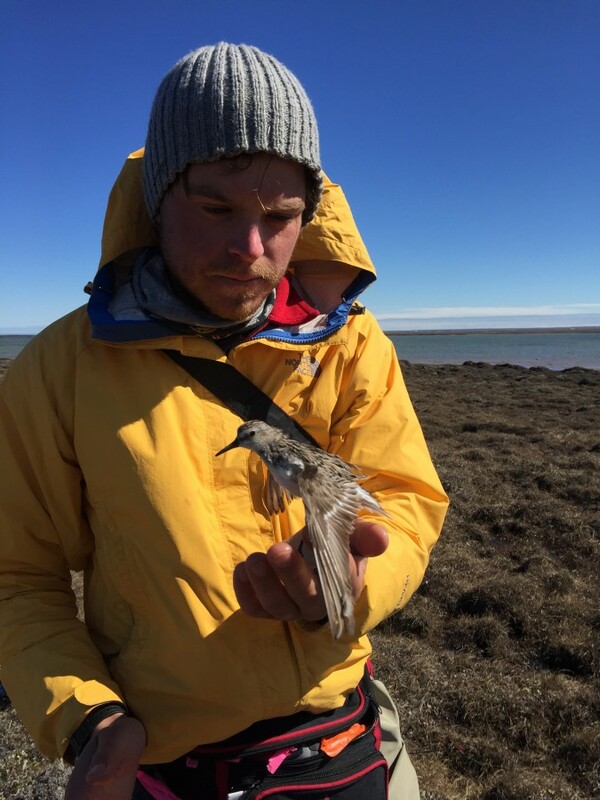 Shiloh also wants to thank Scott Flemming from Trent University – even though Scott is in the middle of his own PhD research, he did not miss a beat when asked to extend his crew to help with the Semipalmated Sandpiper tagging project. The crew also included Rianne Mariash, Malkolm Boothroyd, and Shawna-Lee Masson, who were a fantastic group of people and a joy to work alongside, with unfailing good humor and rock solid work ethic and nerves. Finally, Ron Porter was extremely helpful in getting the geolocators mounted, calibrated, and ready for the field, and his advice on how to deploy the tags was hugely appreciated. Malkolm Boothroyd, a technician for Trent University, releases a tagged Semipalmated Sandpiper. Photo by Shiloh Schulte. We will be working through the fall and winter, sorting out all the data from our arctic expeditions and, along with all our partners, working to learn as much as we can about what limits shorebird populations, and how they can be conserved. None of this would have been possible without the generous support of the National Fish and Wildlife Foundation, the US Fish and Wildlife Service, Environment Canada, and the generous donors to Manomet. 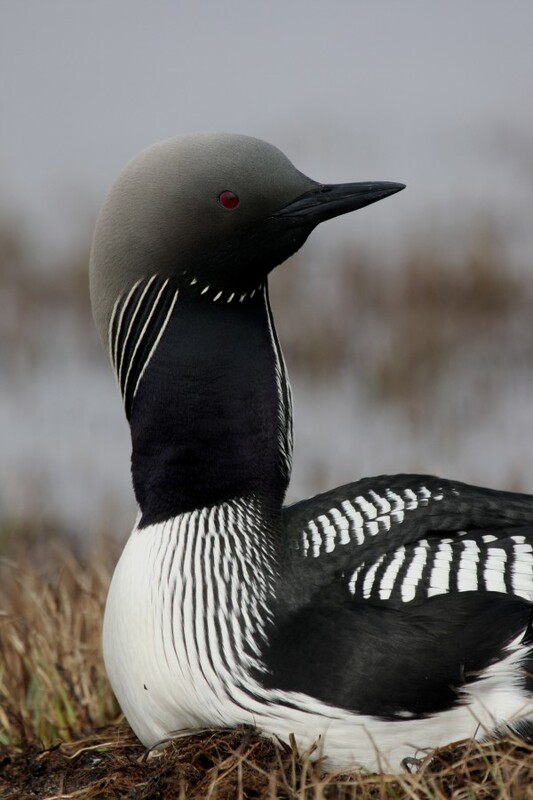 One key donor supported most of the matching requirement for our grant from NFWF, and the project simply couldn’t have been done without this key support. Thank you to all our partners and supporters, and we will look forward to everything we can learn together, and to planning next year’s work in the arctic! After weeks of fog and overcast, a window of clear skies opened up over the Island on July 3rd. I was supposed to leave camp on the 5th along with researchers from a seabird camp on the other side of the island. They opted to move the flight up a couple of days and head out early in case the weather closed in again. My last few days on Coats Island were productive. No more polar bears in camp, and I put out the last tag on July 1st, for a total of 29 geolocators on Semipalmated Sandpipers this year. Despite a slow start to the nesting season and prolonged bad weather, the nest total steadily climbed as the Semipalmated Sandpipers finally nested in good numbers and other species that had lost nests to foxes tried again. Although we did not find any more birds tagged with geolocators in 2013, we did spot six Semis that we had tagged last year with numbered flags on Coats Island last year, as well as a Semi banded in the Bay of Fundy, and another from the Delaware Bay. 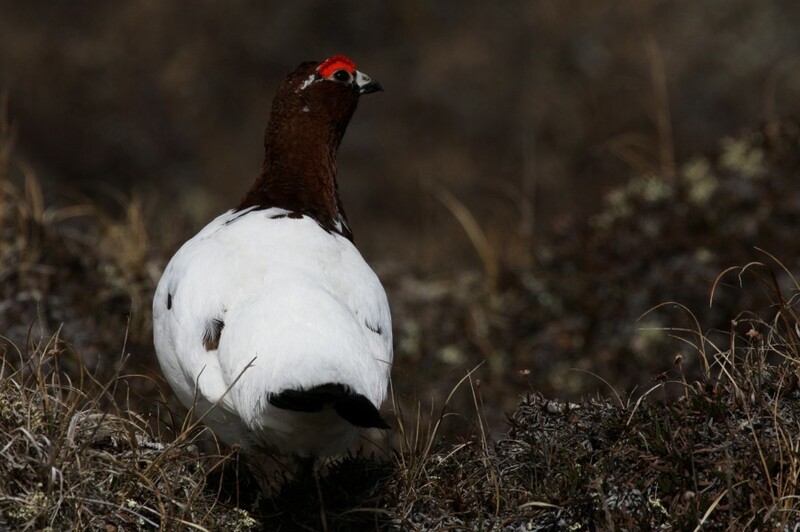 A Willow Ptarmigan strutting his stuff near camp. We named this one “Pterry”. 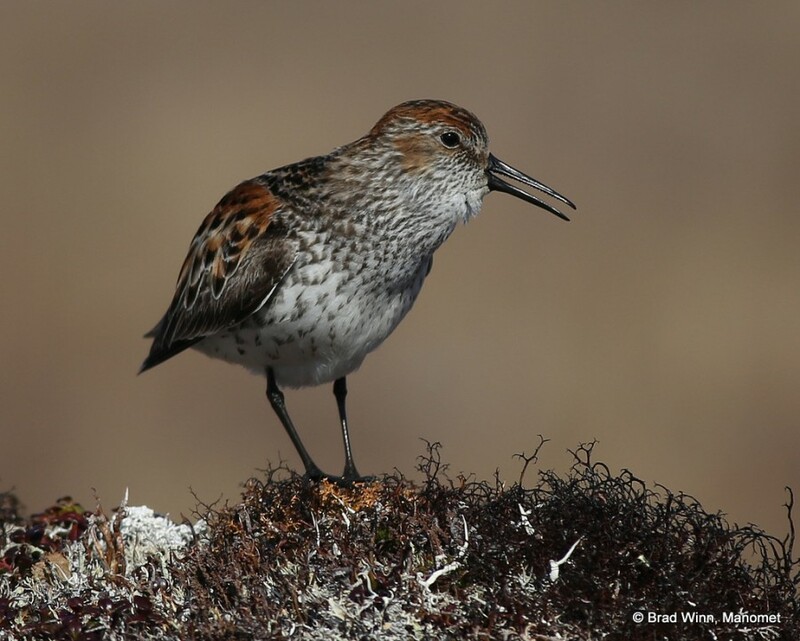 Coats Island is a very important breeding site for Semipalmated Sandpipers, with one of the highest known nesting densities in the eastern Arctic. 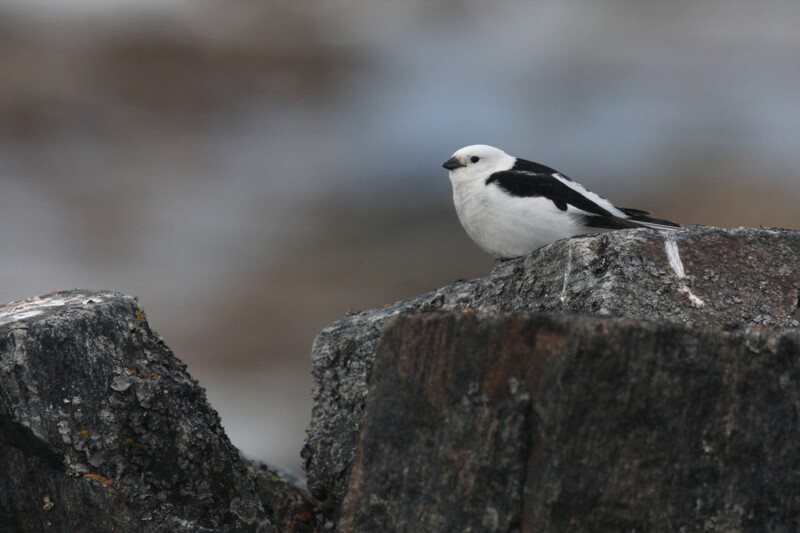 We need to understand where and when these birds are going during migration and wintering in order to help the population recover from the alarming declines observed in recent years. As it happened, the good weather held out long enough for the Twin Otter aircraft to make it to the Island, but the weather in Iqaluit (our destination) closed in with fog and rain during the day. We ended up spending the night in the small community of Coral Harbour on Southampton Island. I was quite familiar with Coral as Brad Winn and I spent a few days there last year on the way in to the Coats Island camp. We stayed again at a tiny hotel called Leonie’s place and enjoyed the first hot shower in weeks! In the morning we headed out early and I made it to Iqaluit just in time to jump on a commercial flight to Ottawa, and then on to Boston and home! 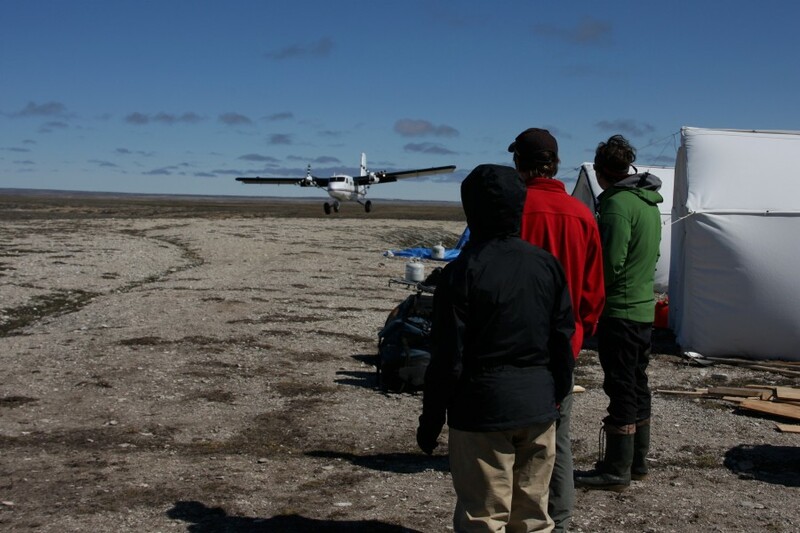 The Coats Island shorebird camp is perched on the edge of a meltwater river. Despite some significant challenges, the project was quite successful this year. This was due in large part to the commitment of our supporters at Manomet, the outstanding cooperation, support, and collaboration from Dr. Paul Smith at Environment Canada, and the on-the-ground teamwork with Scott Flemming of Trent University and his intrepid crew, Rianne, Malkolm, and Shawna. Scott and crew are still in camp and last I heard they were over 100 nests on the season and filled with a sense of foreboding over the impending mosquito hatch. They did get a resupply of coffee on my flight out though, so I think all will be well. The short arctic summer feels even shorter this year, with temperatures close to freezing each morning and windy and foggy conditions most days. It is hard to believe it’s almost July. Yesterday was beautiful though, and we all took advantage of the good weather to spend a long day in the field. We caught and geo-tagged another nine Semipalmated Sandpipers, for a total of 24 so far this season. Next year we will recapture the returning birds and remove the tags to get the track of their entire annual migration. Rianne Mariash and Scott Flemming returning to camp after a long day in the field. While out in the field tagging Semipalmated Sandpipers (affectionately known as SESA or Semis), we also find nests of other arctic-breeding shorebirds, including Dunlin, American Golden Plovers, White-rumped Sandpipers, Red Phalaropes, Ruddy Turnstones, and Black-bellied Plovers. On a still morning (few and far between) you can hear the descending “jreeeeeeeeeeeeee” calls of displaying Dunlin, the “whirrrrrrr” of Semipalmated Sandpipers, and the plaintive “Tu-wheee” of the Golden Plovers. A Semipalmated Sandpiper tagged with a geolocator. This bird will travel to South America and back over the next 12 months. We hope to see him again next year to retrieve this tag and recover the data. 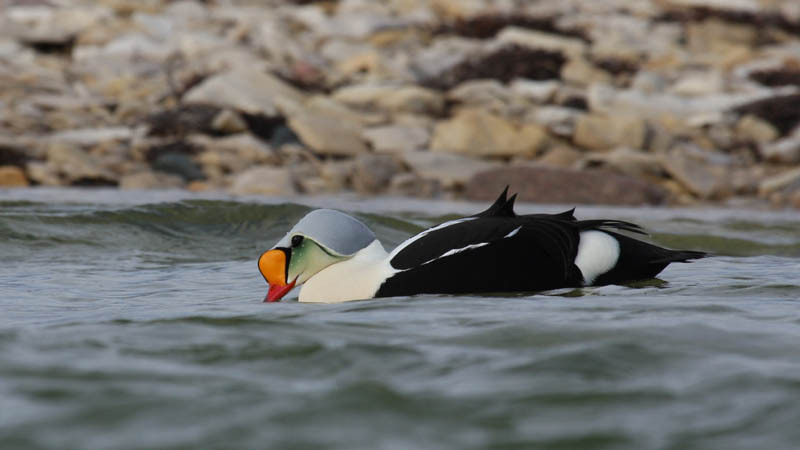 A few King Eider are still courting in the ponds, but most of the females are incubating, while the males return to the open ocean. A pair of Tundra Swans have been visiting the ponds near camp and the Pacific Loons are on eggs. Cackling Geese and Snow Geese are all over the study area and have increased substantially in recent years. 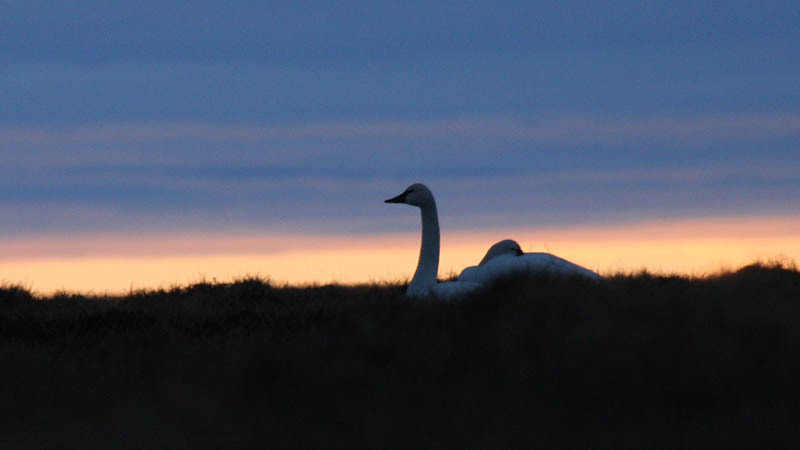 One of the goals of the Environment Canada/Trent University research team is to understand the effects of increasing goose populations on Arctic nesting shorebirds. In addition to birdlife, we have a few mammal species on the island. Arctic Foxes are frequently seen cruising the study area looking for goose and shorebird nests. Our crew is good, but the foxes have keen noses and are likely beating us in the nest finding game. 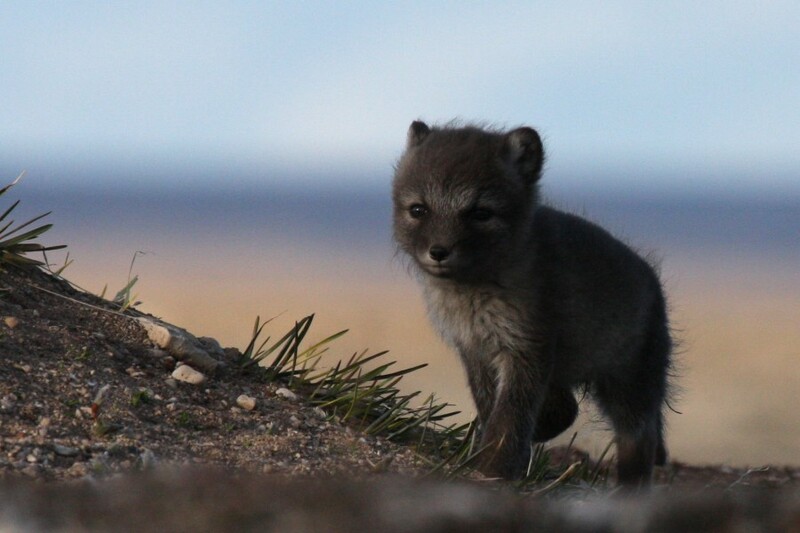 Arctic Fox kits win the prize for cutest babies on the tundra. Last night, I hiked out a few kilometers to visit a fox den on a nearby river. Scott had spotted baby kits near the den and I wanted a look. No adult foxes were around, but the babies were playing near the mouth of the den and were fascinated with me for a few minutes. They all spooked at a passing Jaeger and disappeared into the den together. 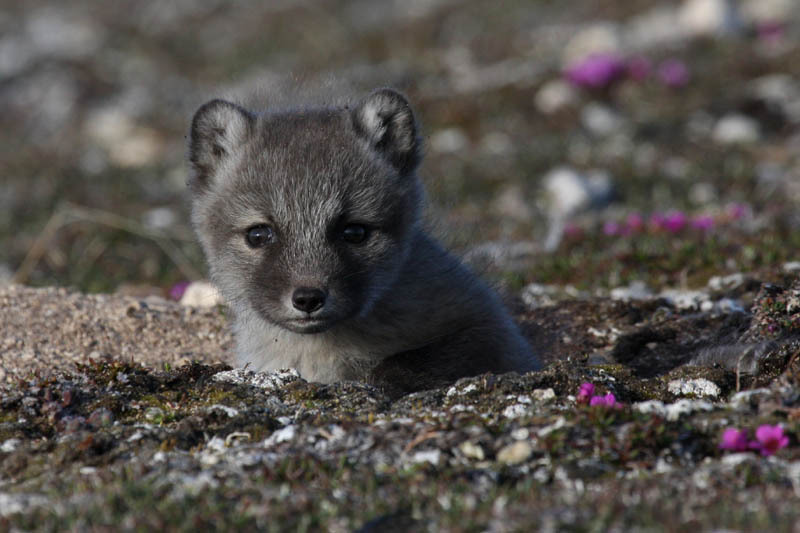 Arctic foxes are a major predator of shorebird nests, but it’s hard to beat the cuteness factor of a baby fox! We have started seeing more caribou in the past few days as well. 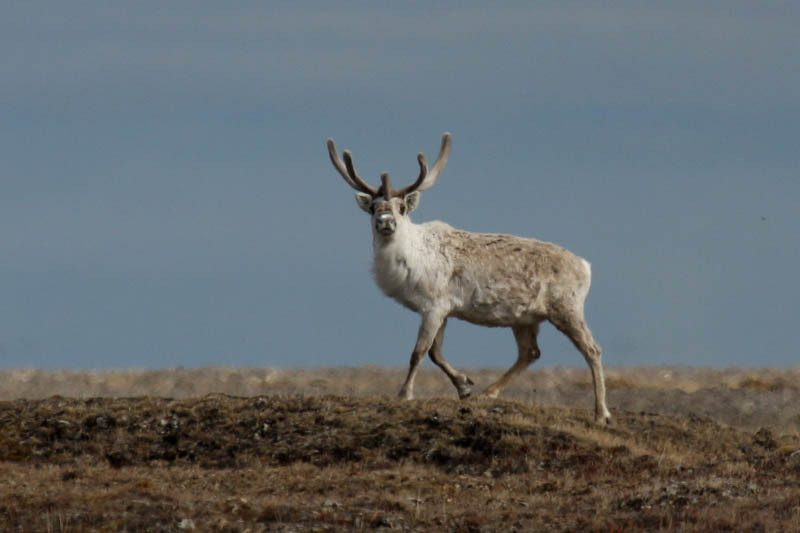 The Coats Island Caribou have very pale coats and the females are smaller and shaggier than the barren ground Caribou of Northern Alaska. Finally, we have polar bears on the island. The bears generally stay on or near the sea ice until July and August when they come inland to look for goose and seabird nests and cross over the island. 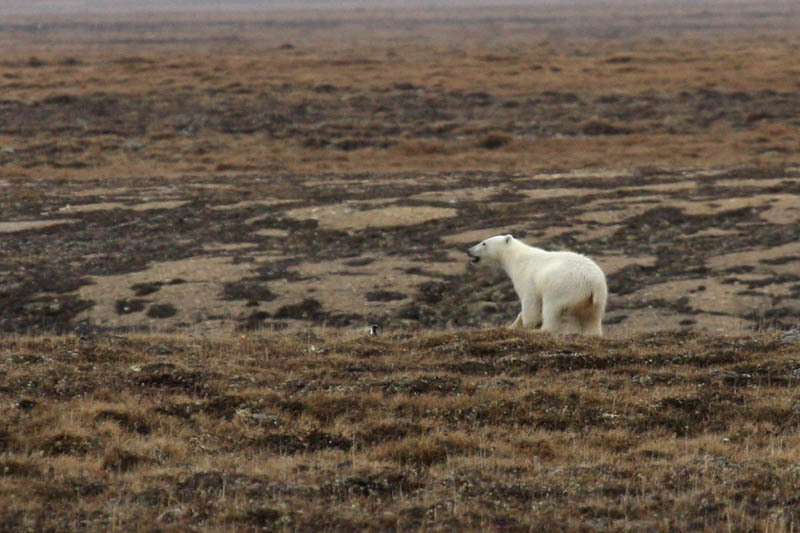 This year, we saw our first polar bears in mid-June, shortly after arriving. We watched a mother and her cub moving inland about a kilometer from camp. We had a good view through the scope but the bears were not nearly close enough to be a threat. A male polar bear retreating from camp. This bear was in camp when we got up, but ran off quickly when we fired off a warning shot. The polar bears are moving inland early this year because of the lack of sea ice. A few days ago we had a much closer encounter. We woke up to find a male Polar Bear in camp nosing around the cooking tent. He was persistent and did not want to leave even after we fired a few warning shots. The crew all reacted well and ultimately we were able to scare it off with cracker shells and shotgun blasts in the dirt nearby. It was good to see him take off across the tundra without any damage to the camp or the bear. This morning we were visited by a larger male polar bear. This one turned and ran as soon as we fired a warning shot, which is what we like to see. He went out and spent some time foraging in the study plots about a mile from camp before moving away inland. This type of bear activity is quite unusual this early in the season and probably is a result of the sea ice disappearing faster than usual. This phenomenon is becoming more pronounced each year as our climate warms. Needless to say, we are staying vigilant and working in teams.